Our residents are encouraged to express themselves artistically and creatively, individually and collectively, according to their preferences. 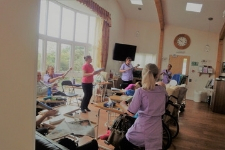 There is a formal recreational programme set up including music and exercise sessions, arts and crafts, singing, Tai Chi and musical events. The Home has its own minibus which is used for regular outings for the residents. 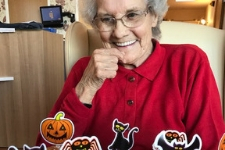 Pinewood employs an activities co-ordinator who as well as setting up communal activities, also visits residents in their rooms to “just chat”. With our own activities organiser, residents will hardly have the time to sit still in between conservation outings, video gaming, bingo, tai chi and visiting entertainers! 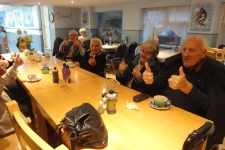 Pinewood believes that it is important for residents to retain their independence for as long as possible and assistance is given to residents to continue any social activity they may have had before they resided at Pinewood. As such, we can take residents to any local clubs, pubs or places of interest. Arrangements can be made for relatives and friends to be collected from the local area so they can visit. There are regular visits made to the home by local vicars and priests and there is a monthly communion service in the lounge. Arrangements can be made for leaders of other religious denominations to visit the home if so required. 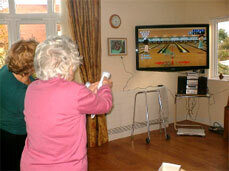 Along with the amazing view onto the Budleigh Salterton coastline, the day room at Pinewood is also equipped with a 52 inch television connected to a Wii games console. The console reacts to body motion and requires each player to carry out appropriate actions depending on what they want their character to do. Every week Pinewood organises minibus outings for our residents to explore the conservation area of Budleigh Salterton. 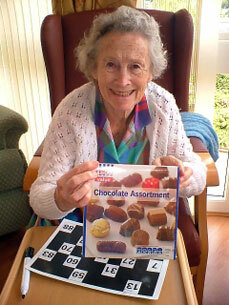 Bingo is a popular activity at Pinewood, especially with the lavish prizes on offer! 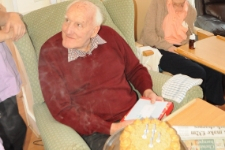 Birthdays are always a special cause for celebration and residents always receive a cake for their special day. 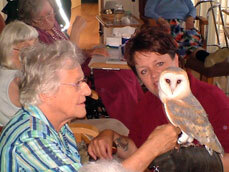 Visiting entertainers and guests such as the local falconry are welcome events.